Results from the global Drupal CEO business survey conducted by One Shoe and Exove, in partnership with the Drupal Association, indicate that Drupal will adopt a role as an enterprise level platform. The Drupal CEO Survey has been carried out this year out for the first time and gives insights in the key issues that Drupal agency owners and company leaders worldwide face. Among the surveyed 75 Drupal companies, the C-level respondents mainly work at digital agencies (37,8%) and software companies (27%). More than two thirds of the respondents (69,3%) were the founders of their company, indicating that Drupal business is entrepreneur driven. As the survey was conducted just before the European DrupalCon 2016, a majority - 65,7% - of the companies have offices in the Europe. Altogether 35 countries were mentioned in the answers, and all continents - except Antarctica - had respondents. The country with the highest amount of offices is the United States (24,3%), followed by Germany (18,6%) and United Kingdom (15,7%). Compared to the size of the country, Finland (12,9%) and the Netherlands (11,4%) had the most respondents. This is partially explained by the survey organizers having headquarters in these countries, but also by wide adoption of Drupal in both countries. Most of the surveyed companies were small to medium sized enterprises. Only 9,9% stated to have more than 80 employees, while 21,9% had five or less employees. The surveyed companies serve clients in numerous industries. From enterprise perspective, the major industries are healthcare and medicine (40,0% respondents have clients from this industry), banking and insurances (38,7%), and retail (37,3%). Overall, Drupal companies also work with charities and non-profit organizations (64%), government and public administration (56,0%), media (49,3%), IT (45,3%), and arts and culture (36,0%). The cost of an enterprise solution project varies from company to company. Most of the companies (28,0%) work in 100 000 - 250 000 euro range, while 18,7% of the companies charge 250 000 - 500 000 euro and also other 18,7% charge 50 000 - 100 000 euro for an enterprise level solution built on Drupal. Only a handful of companies, 4,0%, charge between half million and one million euro. Compared to typical cost of enterprise level solutions, Drupal based solutions are implemented with less costs. This is due to the good fit of Drupal to the enterprise needs, flexibility of the platform, and huge amount of readymade modules. The surveyed executives forecast growth in their business - 89,2% of the respondents think that their company’s headcount will increase in the future, while just 8,1% believe the headcount will stay the same. The rest (2,7%) didn’t have an opinion on the matter. The growth has also been strong during 2014-2016, as the amount of larger agencies (over 80 people) has grown from six to nine among the 75 respondents during this period. The most important strategic priorities of the companies also focus on growth: finding the right talent, 53,3%; ensuring financial growth, 45,3%; and developing new growth strategies, 41,3%. The executives expect to face challenges in the coming three years on the same areas: finding the right talent, 59,5%; talent retention, 36,5%; and ensuring financial growth, 33,8%. While finding and retaining the talent is seen challenging, 60,0% of the respondents do not outsource work to vendors. Companies operating in Europe less use outsourcing, as 67,0% of these companies do not employ vendors. European companies outsource work to Asia (17,0%) and Europe (17,0%), while non-European companies use vendors in North America (25,0%), South America (25,0%), and Asia (19%). Also illustrating the growth-empowering aspects of Drupal is the geographical presence of companies. One third (31,1%) of the surveyed companies have offices in more than one country, and 12,0% has offices in five or more countries. 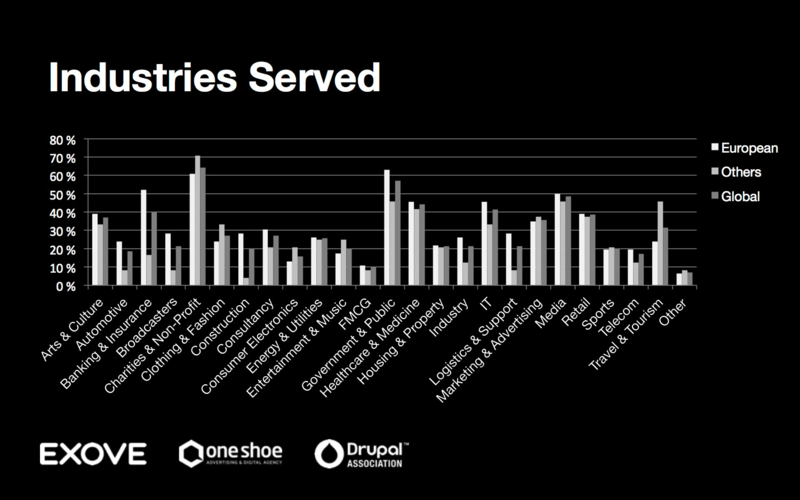 The majority of the companies (70,3%) combine Drupal with other technologies from time to time. Of those, 29,7% do it often or regularly. Only a handful of companies, 4,2%, use also commercial content management systems in combination or integration with Drupal. Exove delivers digital growth. We help our clients to grow their digital business by designing and building solutions with agile manner, service design methodologies, and open technologies. Our clients include Sanoma, Fiskars, Neste, Informa, Trimble, and Finnlines. We serve also start-up companies, unions and public sector. Exove has offices in Helsinki, Oulu and Tampere, Finland; Tallinn, Estonia; and London, United Kingdom. One Shoe is an integrated advertising and digital agency with more than 10 years experience in Drupal. 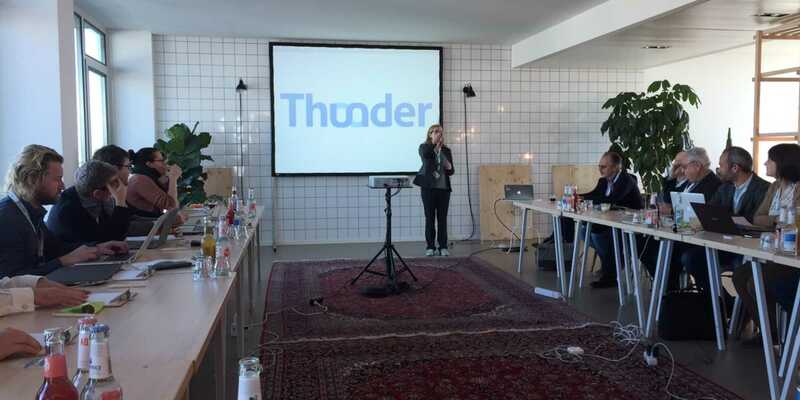 With more than 40 specialists, One Shoe combines strategy, UX, design, advertising, web and mobile development to deliver unique results for international clients like DHL, Shell, Sanofi, LeasePlan, MedaPharma and many more. For more information, please visit www.oneshoe.com. The Drupal Association is a non-profit organization headquartered in Portland, OR, USA. It helps the Drupal project and community thrive with funding, infrastructure, and events. Its vision is to help create spaces where anyone, anywhere, can use Drupal to build ambitious digital experiences. For more information, please visit association.drupal.org. For media enquiries, please contact Janne Kalliola (janne@exove.com), Michel van Velde (michel.vanvelde@oneshoe.com), or Brad Fields (bradley@association.drupal.org).